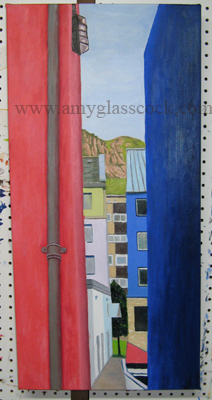 I'm making the canvas for my new Scotland painting today. Here is a quick sketch of the painting. 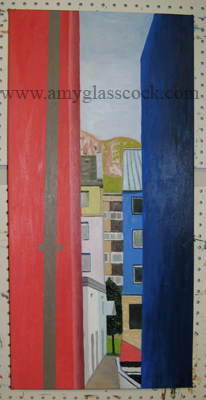 It will be an alley with a bunch of brightly colored buildings. Some progress... 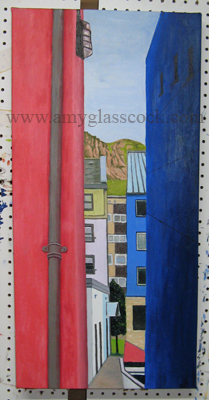 I started adding the Salisbury Craig cliffs in the background, the sky color, and the buildings! I like this one a lot so far! It's already starting to come together and it makes me happy! 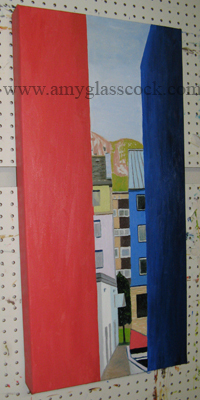 I worked on the buildings in the middle mainly today and I also made the blue building darker blue. 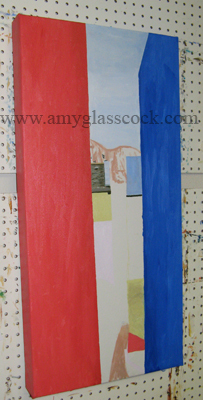 This was my last Saturday painting in this art studio. It has been good to me for the past year and a half, but it's time to move on... goodbye. I had lots of time to paint today! Yay! I added the building on the left and fixed the path in the foreground. 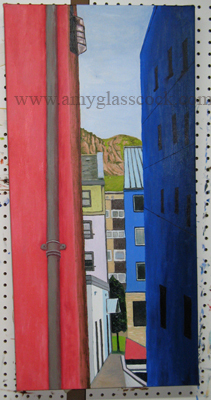 I also added some to the windows and blue roof. A special thanks to Bonnie for the new tunes! Inspirational Song of the Day: Keith Urban, "Making Memories of Us." Inspirational Song of the Day: "She Moves in her Own Way", the Kooks. 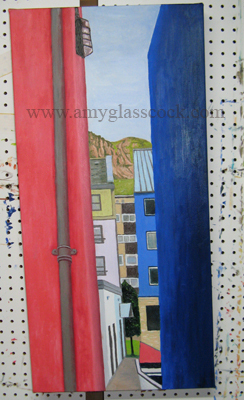 I added the drain pipe and the side of the red building. Inspirational Song of the Day: "Falling in Love in a Coffee Shop", Landon Pigg. I made the water spout look dimensional (No itsy bitsy spider though unfortunately...) and I added slight contrast to the colors in the wall. I also added a friendly euro light fixture at the top. Inspirational Song of the Day: "Signature of Divine", Needtobreathe. "I've seen the paths that your eyes wander down... I want to come too." ***My 1st time to work in my new art studio! YAY! I worked on the cliff in the background which is actually called Salisbury Craig. Inspirational Song of the Day: The Proclaimers, "I would walk 500 miles." 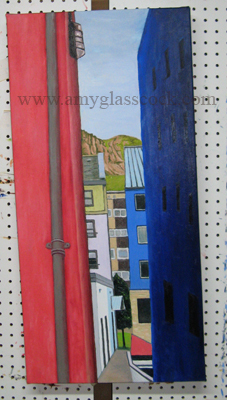 I worked on the buildings today. 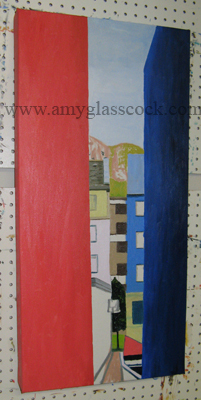 I worked more on the buildings today. 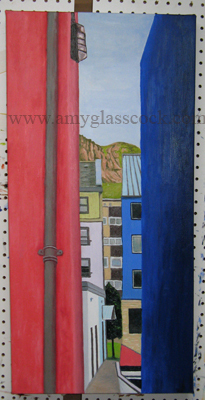 I worked more on the buildings in the foreground today. 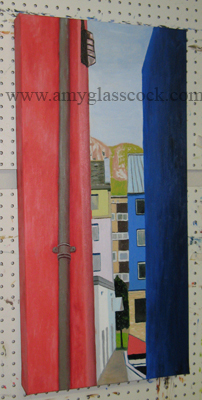 I am trying to get the side red wall to not look like it is bubbling forward and I am working on the blue wall's window placement. I'm getting close to finishing this one... maybe tomorrow? Fingers crossed.